An Alternative? With the new release of the Travelmate TimelineX series, Acer naturally also offers a 14 inch notebook with the latest components, which is compact, but meant to be an equal to its bigger brother. 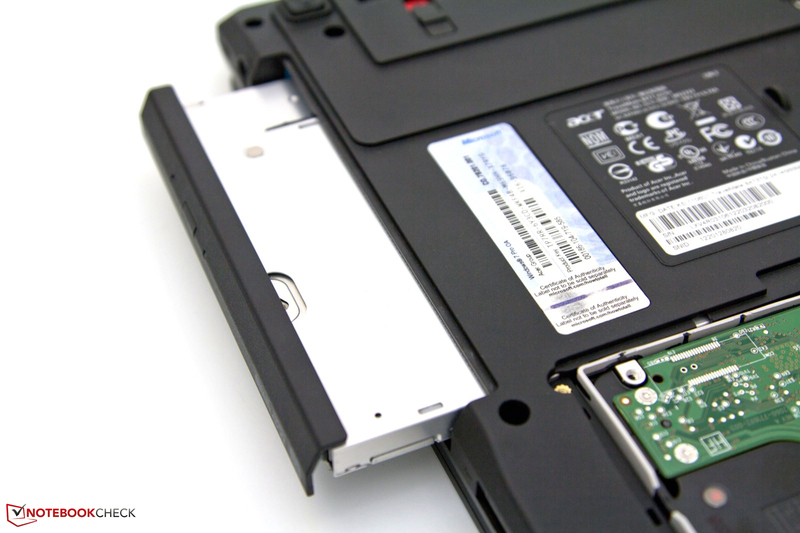 Read on, as we find out if you get a well rounded package for 1000 Euros, that measures up to established B2B notebooks. Robust, mobile, equipped with the latest hardware and security features. 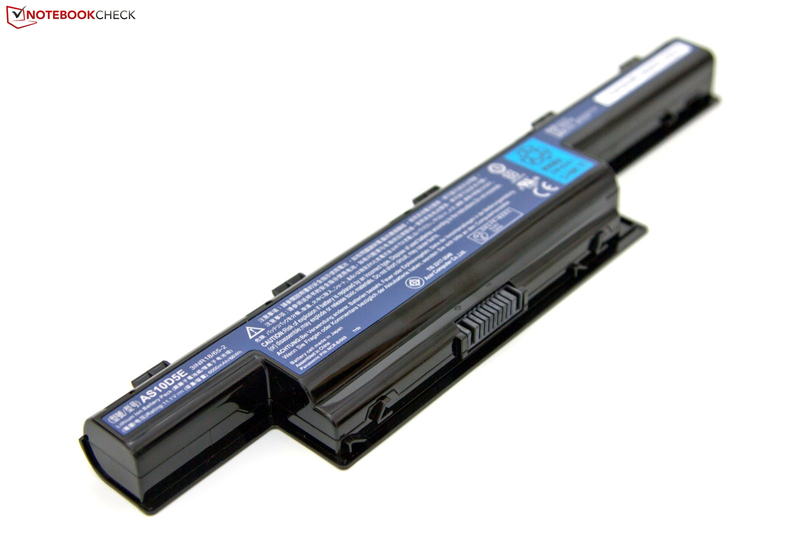 These are corner stones for the Acer TravelMate TimelineX 8473TG, setting it apart from the consumer oriented Aspire TimelineX series notebooks. Target market of this notebook are business users and others who have enough of high gloss case components and bad workmanship. In contrast to the already tested Acer TravelMate TimelineX 8573TG, our current test model sports the ever more popular 35.6cm 14 inch display size and a total weight of 2.4 kg (5.3 lbs). 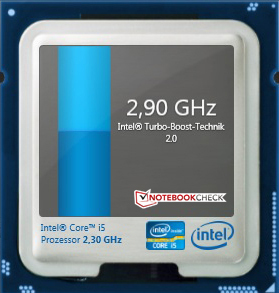 A smaller notebook does not automatically mean less performance these days. Speaking of performance, inside our 8473TG-2414G50Mnkk, we find the heartbeat of Intel's Core i5-2410M dual-core CPU, clocked at 2.3 GHz, paired with the middle class Nvidia GeForce GT 540M GPU featuring 1 GByte dedicated DDR3 RAM. Further highlights are a USB 3.0 port, eSATA, a TPM security chip, and a docking station connector. At first blush, we miss an integrated UMTS module to round out the picture of a model under 1000 Euro, but this will be available for a surcharge in a variation of this unit. Read on to find out how this child of Acer compares with other B2B notebooks, and what its strengths and weaknesses are. 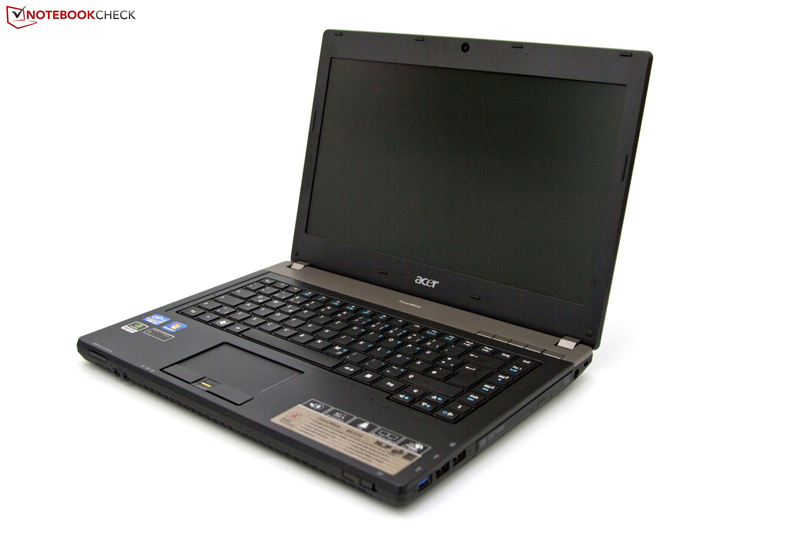 Concurrent with the hardware update, Acer also provides a new exterior for the smaller 14" notebook of the series. The case is forged from magnesium-aluminum alloy, highlighted with an aluminum cover for the display lid. Visually, the combination of black and grey fails to make the most of the materials used. 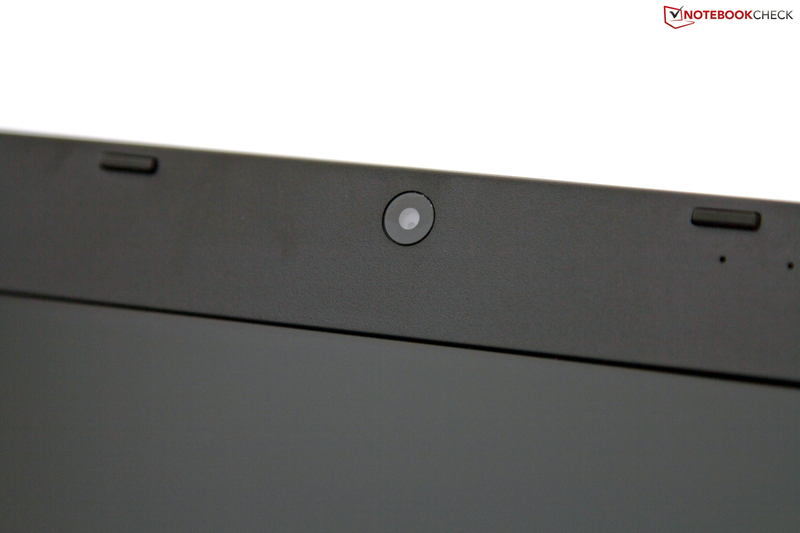 The square, hard-edged design appears unadventurous, while the cheap looking matte black plastic display bezel doesn't fit into the picture of a business notebook. In regards to resistance, the all around matte housing is superior to its glossy peers. Fingerprints on the aluminum display lid are hard to avoid though. 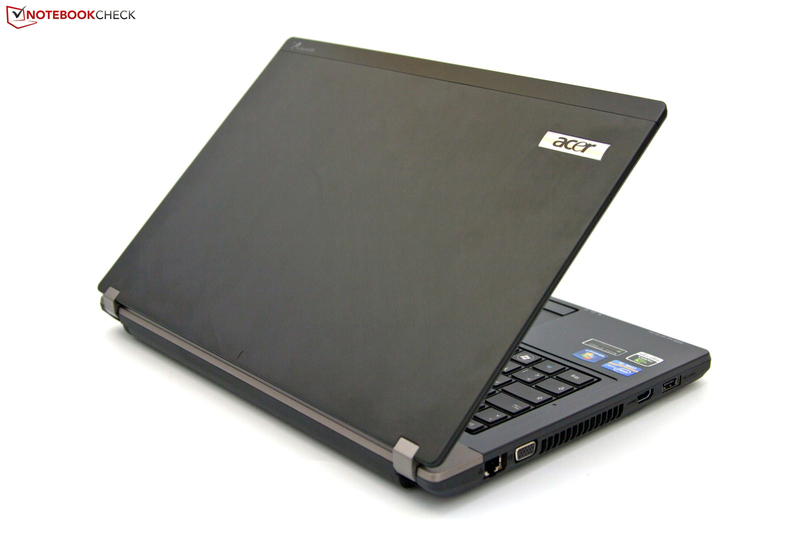 The stability of the case leaves a good impression, while in this notebook like in others, the area with the integrated DVD drive is the weakest point in case of stronger pressure. The display lid is not very sturdy, due to the thin build. The small metal hinges are a plus point, they hold the display solidly in the desired position. For transport, here too, we are missing a mechanism to latch the display to the base unit. A look at the bottom of the unit convinces us. 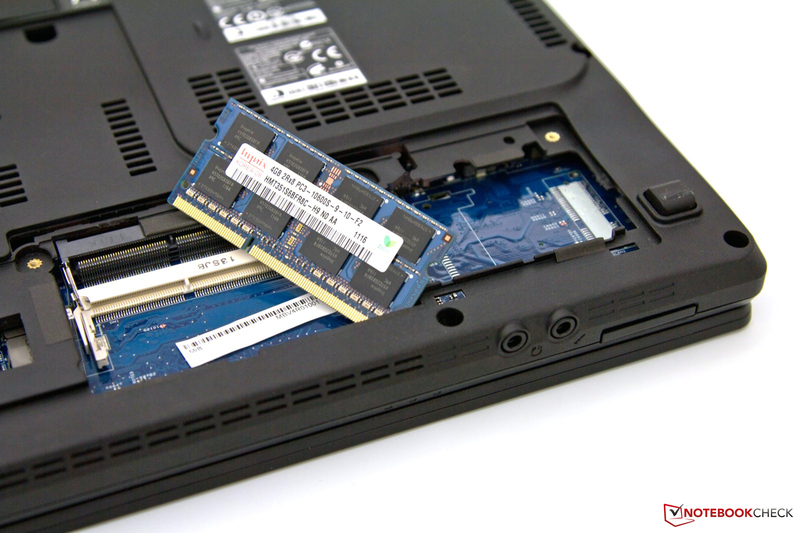 Beneath the largest access cover, held by five screws, we find 2 RAM sockets for DDR3 RAM and a spot for a UMTS module. Regrettably, the necessary antennae and connector for that module are missing, so a later upgrade is not possible. 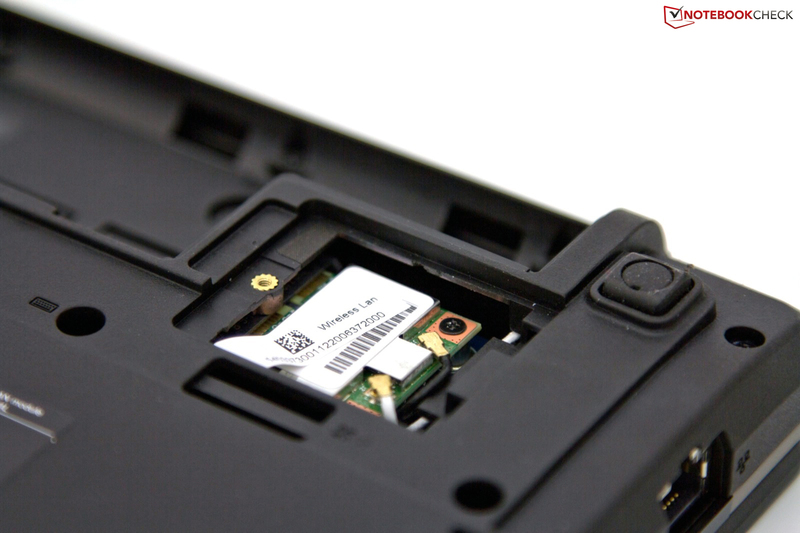 A WIFI module hides under a very small access cover, with two antennae who's ends end above the display. 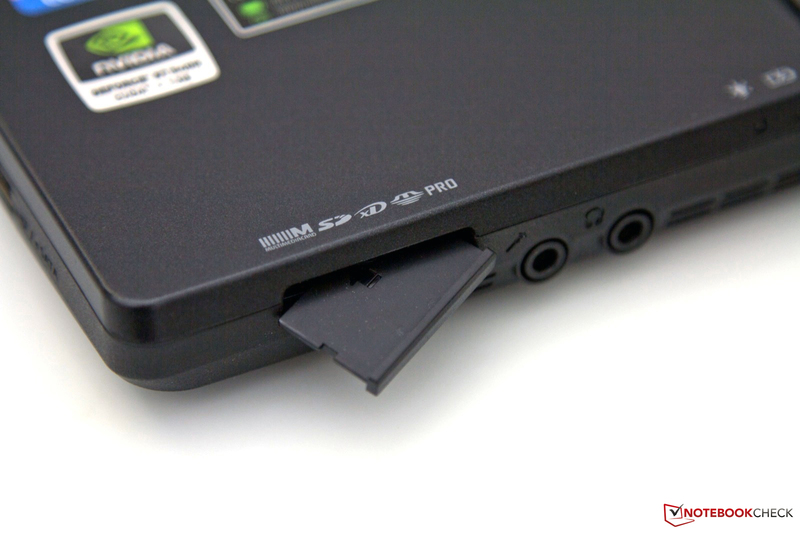 The integrated dock connector for an Acer ProDock and the facility to quickly change out the DVD drive with a sliding mechanism meet our approval. A look at the notebook's sides shows small cuts due to the smaller case. 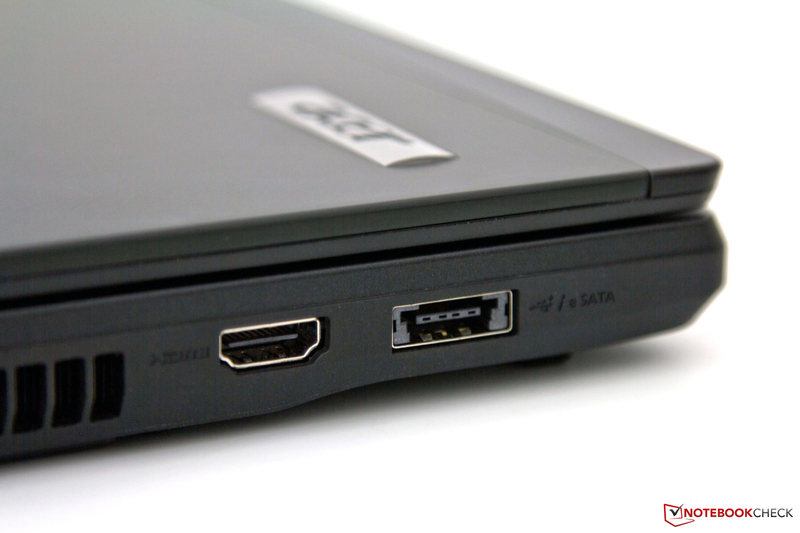 Acer offers a good set of interfaces, including a USB 3.0 port, an eSATA combination, an HDMI port and a USB 2.0 port with charging capability even when the notebook is turned off, and more. In comparison to the larger TravelMate TimelineX 8573TG the ExpressCard/34 slot and the SmartCard reader security feature are missing. We would have preferred to trade the DVD drive for additional connectivity interfaces. The offered communication options paint a convincing picture. Aside from Gigabit ethernet over a Broadcom NetXtreme controller, WIFI 802.11n as well as Bluetooth 3.0+HS are supported. 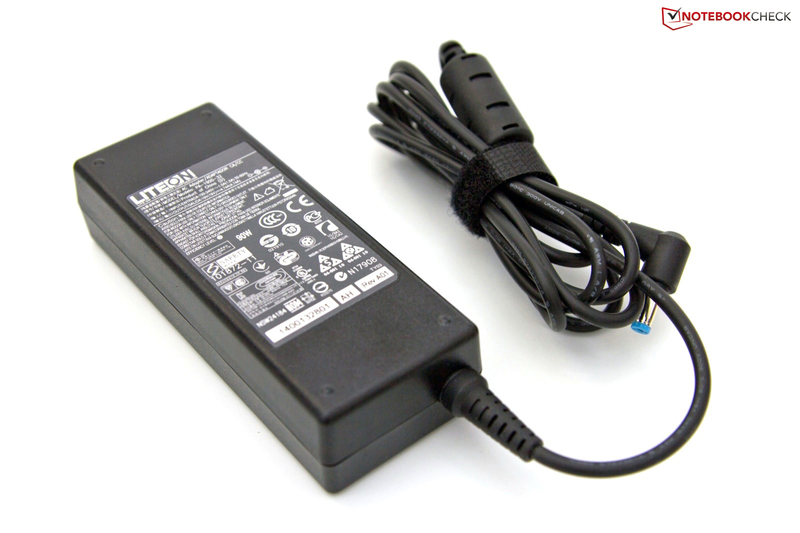 A UMTS module is not supplied in our model (8473TG-2414G50Mnkk). The necessary space for it is there, but antennae and socket to plug it into are not evident. As hinted above, Acer cut down slightly on security features. Because of the smaller case, no space could be found for the SmartCard reader. 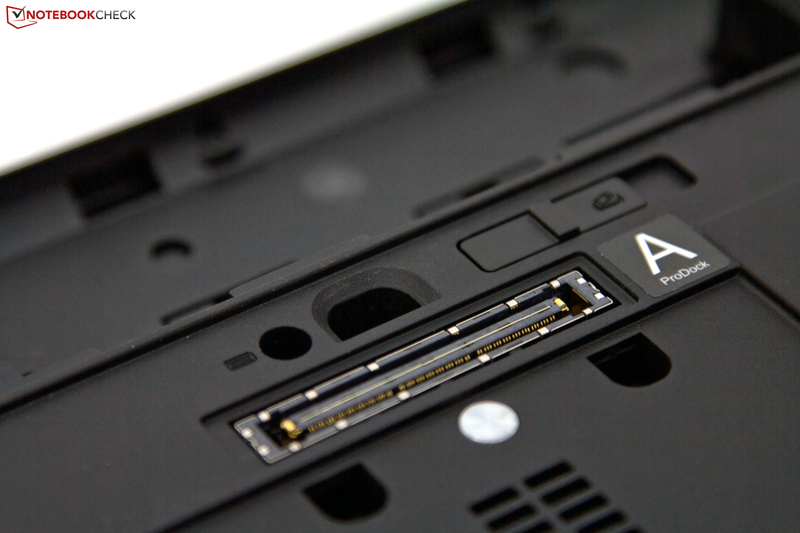 The space saving Kensington lock slot, the fingerprint reader and the trusted platform module (TPM) remain in place, however. During unpacking, disappointment initially sets in, because only the most standard accessories are included. Besides the notebook itself, there is merely the 6 cell battery, a 90 Watt charger, a little bit of documentation and a black micro fiber cleaning cloth provided. Optional offerings are extensive with Acer; among them, the Acer ProDock, that changes hands for roughly 180 Euros. The pre-installed software continues in the same vein as the hardware accessories, where McAfee's test version is particularly annoying with its pop-ups. We suggest to examine the offerings carefully and proceed to uninstall superfluous software. 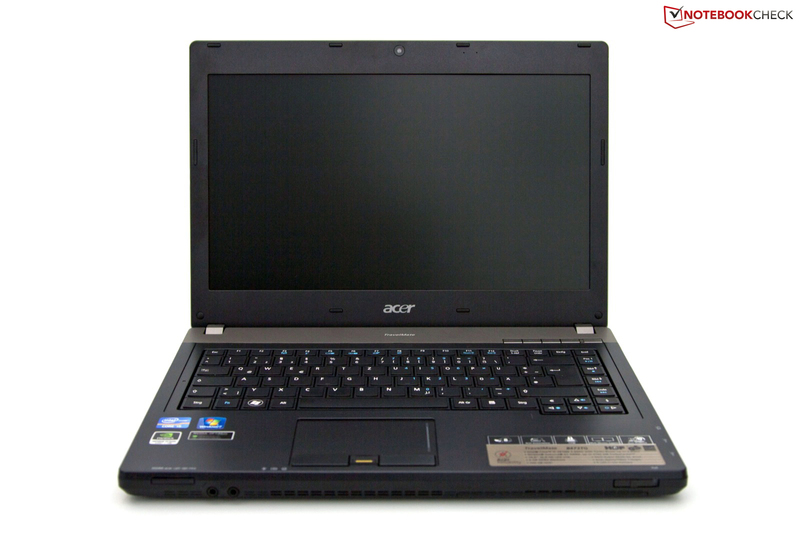 Acer offers 24 months warranty and also includes 12 months International Travellers Warranty (ITW). With this, the manufacturer matches the average of the B2C market for consumers. Extended warranties are offered, starting at about 70 euros. The chiclet keyboard from the current Aspire TimelineX series (3830TG, 4830TG, 5830TG) has not found entrance with this refresh yet. Acer keeps using their familiar gap-less floating keyboard here. 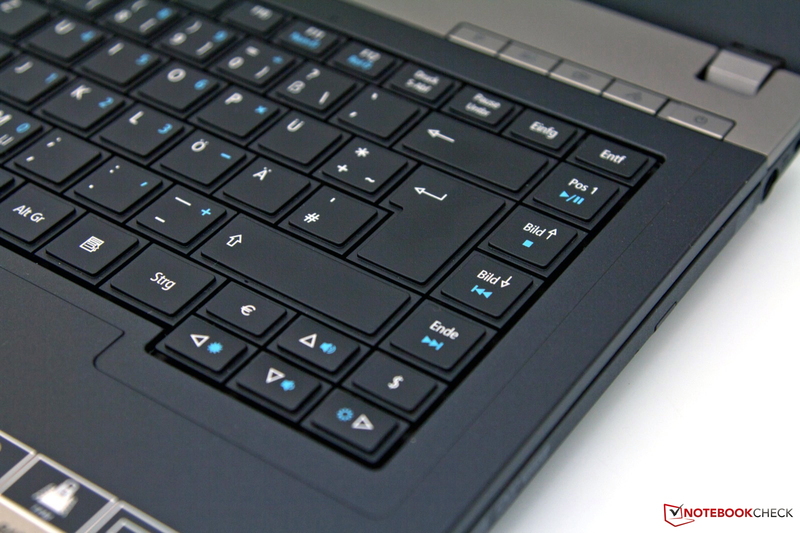 The keyboard sits on firm footing and the tightly controlled motion of the keys is enjoyable. The keys are sufficiently sized at 14 x 14mm and the layout is easy to get used to. 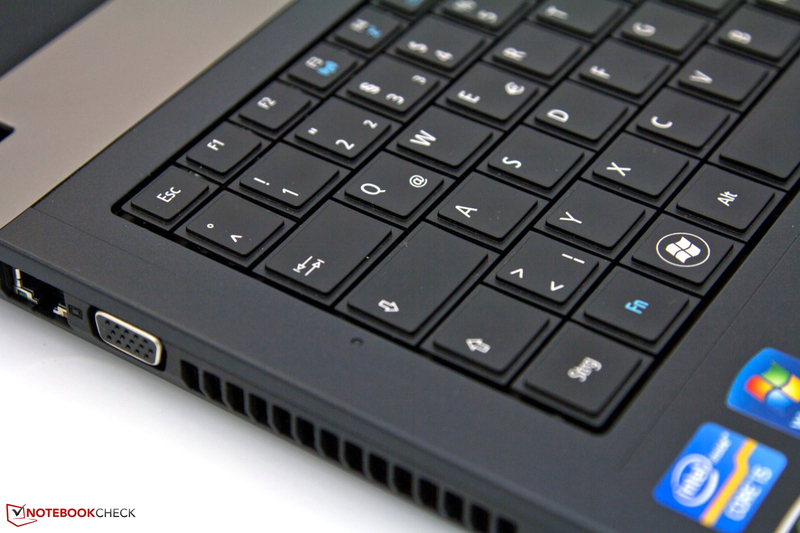 The standard positioning of the left CTRL key and the upper right DEL key helps, as does the clear labeling of Fn-key functions. Sole drawback for some users is the missing number key block and a propensity of dirt or crumbs getting in between the keys. Regrettably, the keyboard lacks back lighting. 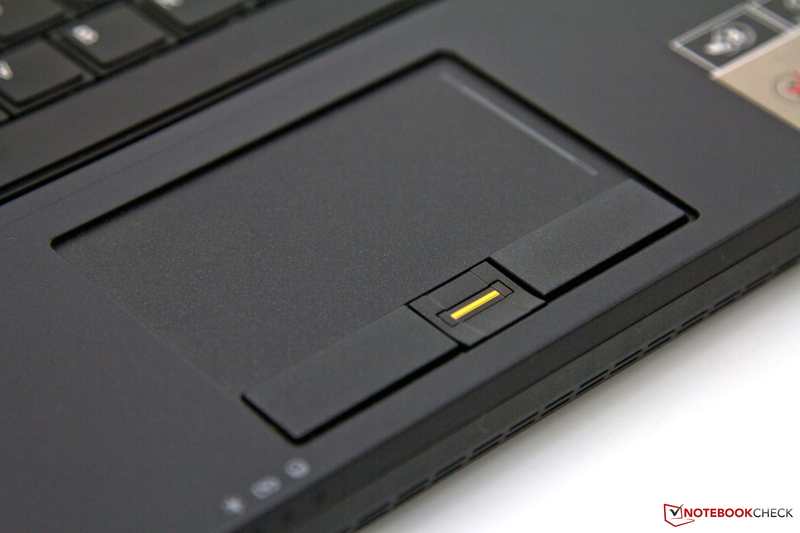 The Synaptics touchpad is sunken into the wrist rest, giving it a clear demarcation. The lightly textured surface affords easy and precise navigation. In addition, diverse multi-touch gestures are supported and a printed vertical scroll bar is also available. 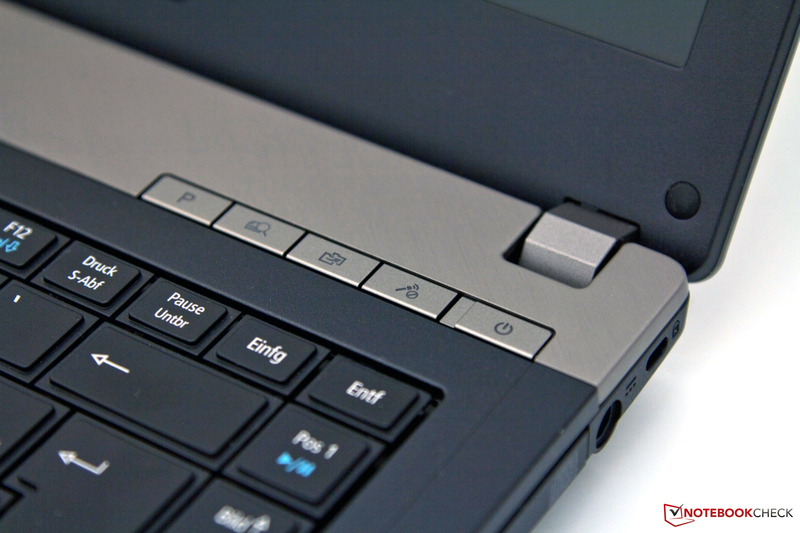 The mouse buttons are distinctly raised and separated from each other by the fingerprint sensor. The long button travel remains a matter of taste. 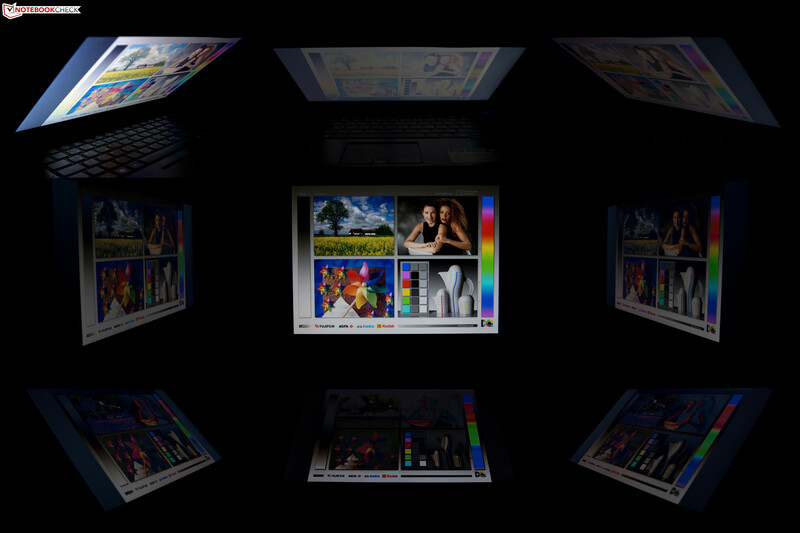 The display is a matte 14 inch HD screen with a resolution of 1366 x 768 pixels in 16:9 ratio. A higher resolution alternative is not offered. 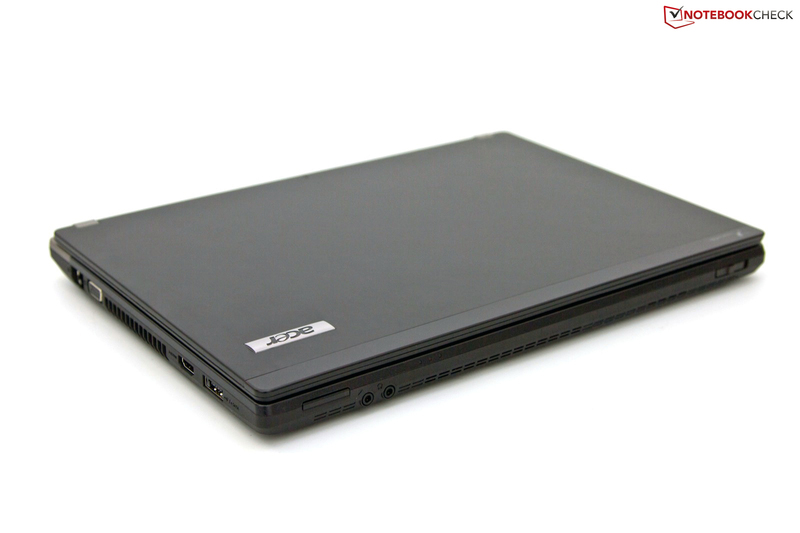 Notebooks like the Lenovo ThinkPad T420 or HPs ProBook 6460b, with a native resolution of 1600 x 900 pixels have a clear advantage. Thanks to the HDMI- and VGA interfaces, you can compensate by using an external monitor for higher resolutions. A test at 1920 x 1080 pixels (Full HD, 1080p) confirmed this statement. LEDs are responsible for the display's back light; they merely left an average picture after measurements with the Gossen Mavo-Monitor tool. With a maximum luminance of 192 cd/m² the display (type AUO313C) only matches cheap consumer models in the range of four to five hundred euros. Aside from that, the very even distribution of brightness (97%) is a positive attribute. Further measurements continue to paint an average picture. The black value is heightened, resulting in a lack of solid black in the display and causing the contrast to be weak. Contrast is especially important for watching movies and for outdoors visibility. In addition to the previous measurements, the displayed color space is an important criteria for business notebooks. Following comparison, we are disappointed that the display doesn't even come close to filling the sRGB reference color space. 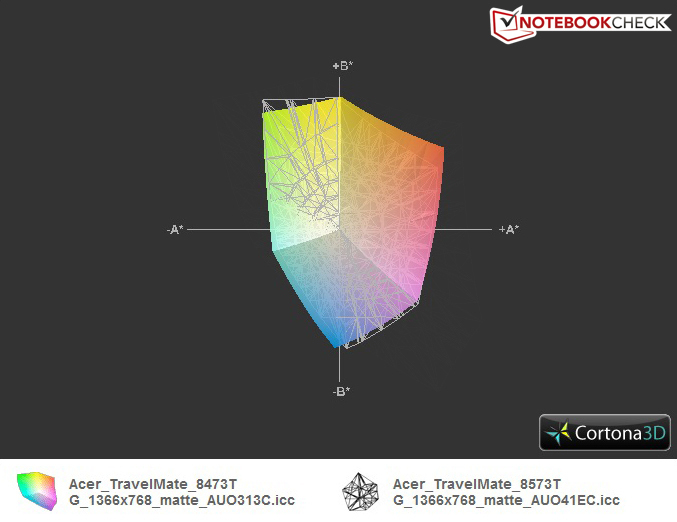 In direct comparison to the larger Acer TravelMate TimelineX 8573TG hardly any difference is noticed. Outdoor usability is limited by the weak LED backlight and the low contrast values. While indoors, you can work without problem, outdoors, it can become difficult to see, depending if its sunny, the screen fails to overcome ambient light. At least, you are spared annoying reflections of the surroundings with the matte panel surface. Viewing angles are also equivalent to cheap TN panels. 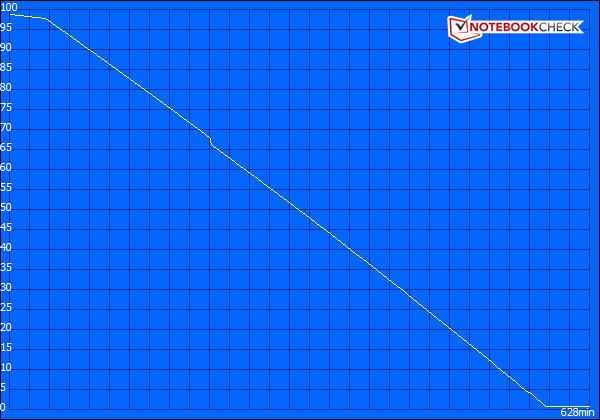 Horizontal angles are relatively stable, even with shallow angles. By comparison, vertical angles quickly lead to brighten or invert the reference image. Only the latest components work inside the Acer TravelMate TimelineX 8743TG, the type you might find in a late model multimedia notebook. 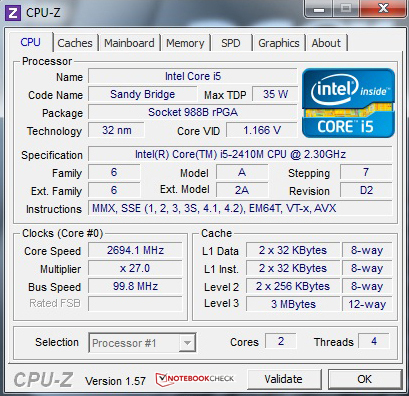 The processor in our test model (2414G50Mnkk) is an Intel Core i5-2410M Dual-Core processor clocked at 2.3 GHz, sporting 3 MByte L3-Cache and a maximum clock of 2.9 GHz with activated Turbo Boost 2.0. Thanks to the improved architecture, its performance surpasses that of comparable Arrandale processors. Overall a popular and cost effective choice, that can also handle most multimedia tasks, thanks to the integrated Intel HD 3000 GPU. As a 3D power-up, Acer has also installed an Nvidia GeForce GT 540M GPU with dedicated RAM, which gets activated depending on settings and application. This process is automatic and transparent with Nvidia's Optimus technology, where the settings can be fine tuned in the Nvidia control panel. The GT 540M is clocked at 672MHz, sports 1GB DDR3 RAM, supports DirectX 11 and its performance ranges in the upper half of midrange GPUs. The first part of our benchmark show-jumping is covered by Maxon's CPU benchmarks, which have been run many a time by the Intel Core i5-2410M. It reached 9378 points in the multi-thread rendering (64 bit) of CineBench R10, and is on a level with comparable configurations. 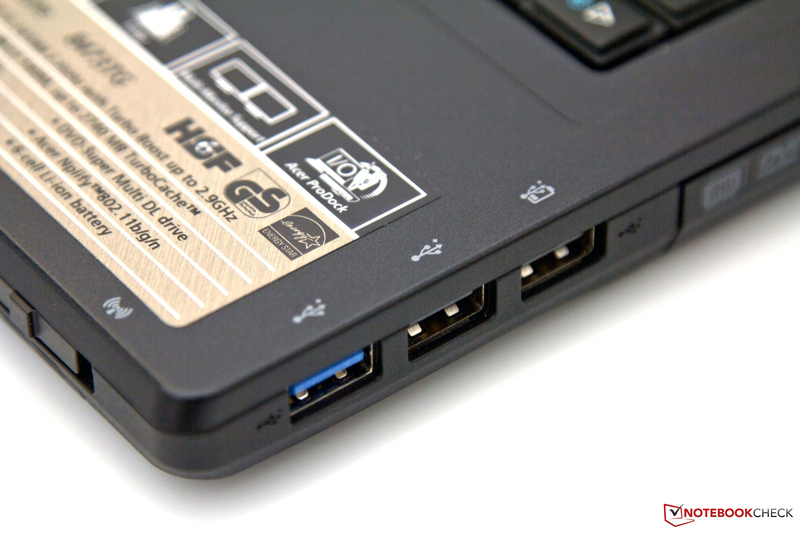 Among them, for example, the HP Pavilion g6-1141sg or the Lenovo ThinkPad Edge E420s. 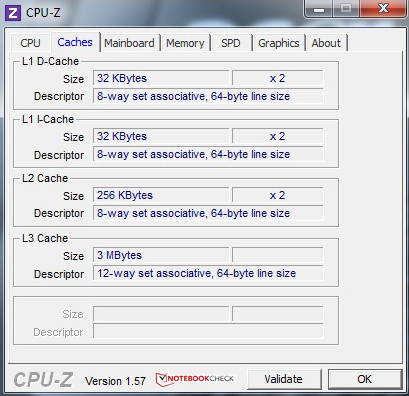 In the newer CineBench R11.5, performance in the upper middle range of our database is confirmed. 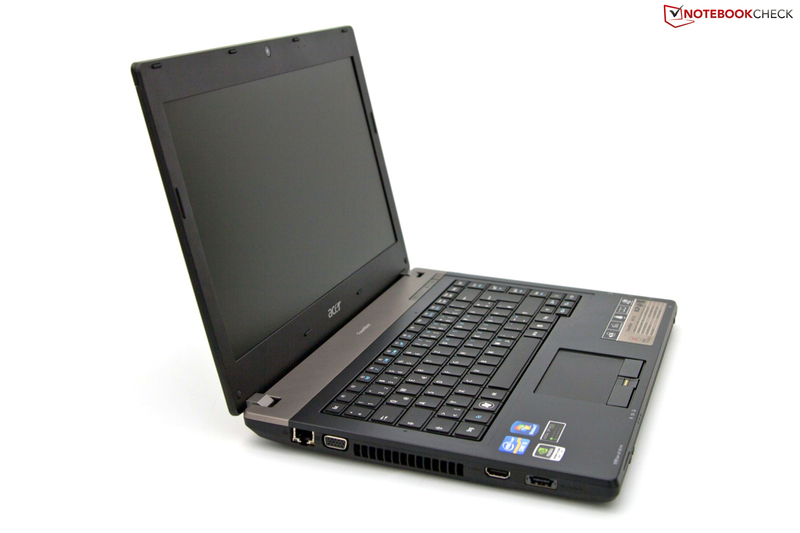 Next to comparable notebooks like the new Dell Vostro V131, notebooks with the Intel Core i5-580M Arrandale processor are in the same range. 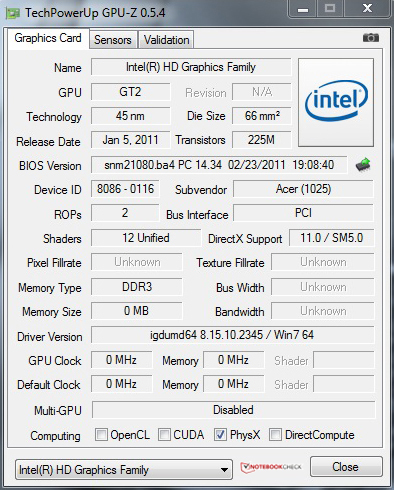 The Nvidia GeForce GT 540M has no need to hide in Futuremark's synthetic gaming benchmarks. 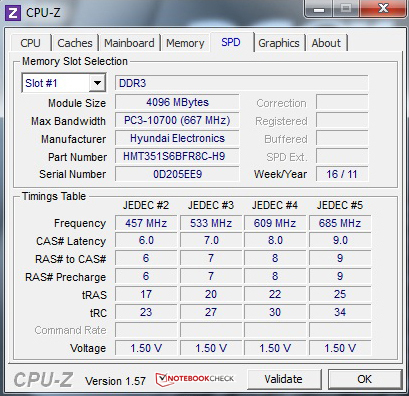 In the older 3DMark 06, the test model was average with a score of 7873, and is surrounded by similar configurations. 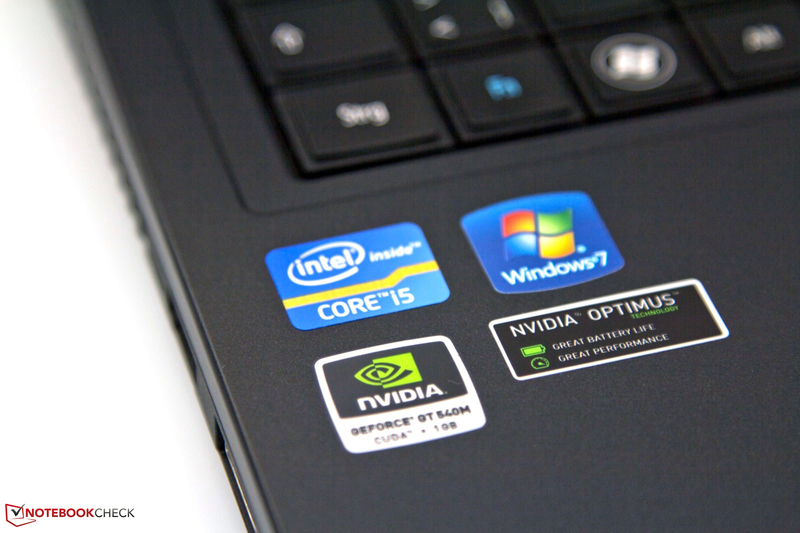 Among them: Dell XPS 15-L502x, the Medion Akoya P6631 or the larger Asus N73SV. The quicker GPUs Nvidia GeForce GT 550M and 555M manage a performance advantage of 11% (Gigabyte P2532N) or 42 % (Alienware M14x). These differences and the generally good performance picture were confirmed by 3DMark 11 for the latest DirectX 11 units. A small resume is made possible by an encompassing set of benchmarks, allowing an overview over numerous criteria and measurements. In the new PCMark 7 our test configuration reaches a result of 1766 points and again ends up in the middle ground of our database and little variance to similar configurations could be found. Overall a good multimedia performance, which could be brought to shine with a solid state drive. 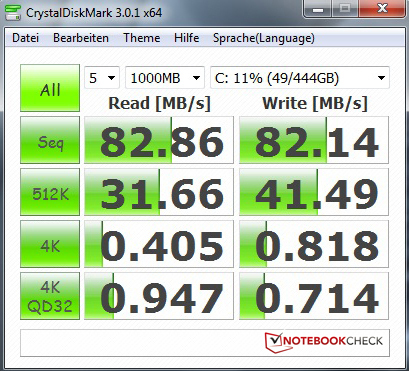 Western Digital's 2.5 inch Scorpio Blue WD5000BPVT-22HXZT1 hard drive may not be fast, but its cheap; a popular mass storage device, with good price performance ratio. With its 5400 RPM and SATA II interface, a maximum of 83 MB/s (read) was possible in CrystalDiskMark. 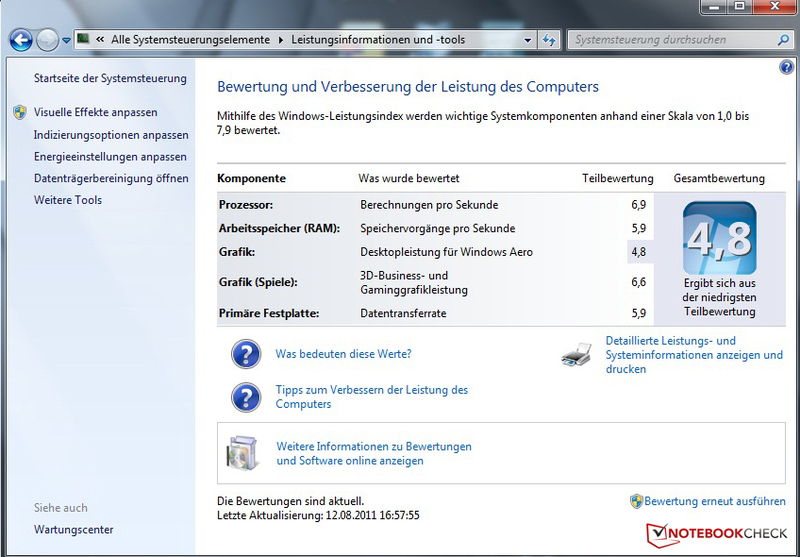 Together with access times (AS SSD) its performance is acceptable, with headroom for improvement. 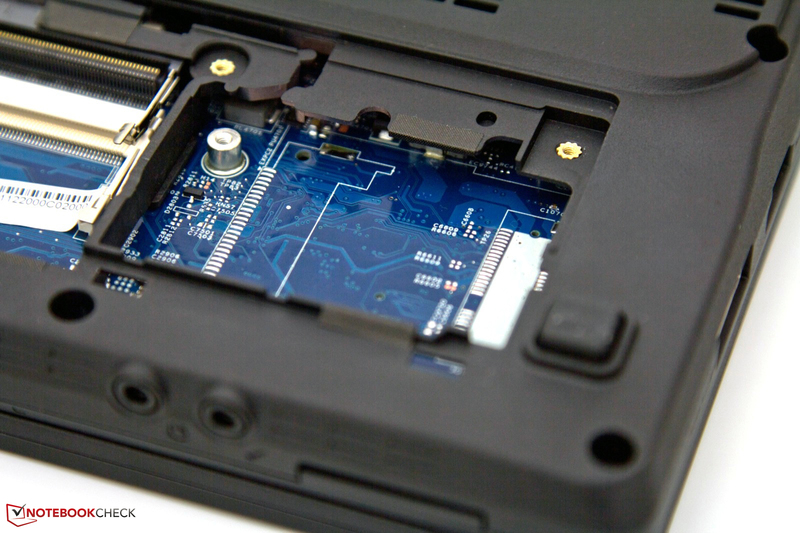 Modern SATA III solid state drives can also be integrated, thanks to Intel's Huron River platform. Examples are Intel's SSD series 510 alias Elmcrest, OCZ's Agility 3, or the Vertex 3. A look at pure gaming performance should not be missing, given the prerequisites. 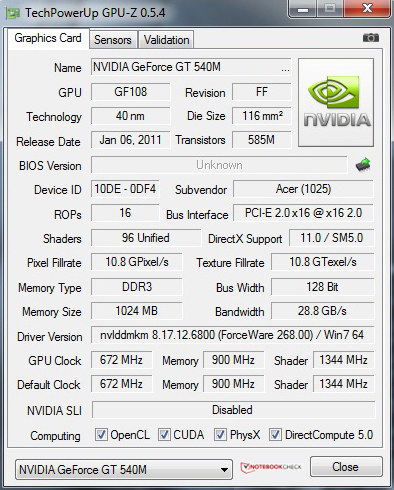 On average, the Nvidia GeForce GT 540M performs well, while its mainly aimed at casual gamers and more prowess is shown in the multimedia area. During tests, we noticed that frames per second with low graphics details are not as good as comparable notebooks. With higher resolutions and detail settings however, results even out. With a cooling fan, hard drive and DVD drive, there's already 3 sources responsible for the noise backdrop. During idle mode, noise levels stay discreetly in the background at values between 32 and 33.8 dB(A) and won't be noticed much. Occasionally, the fan howls for no apparent reason, and we were able to measure a peak of 48 dB(A) which received negative notice. 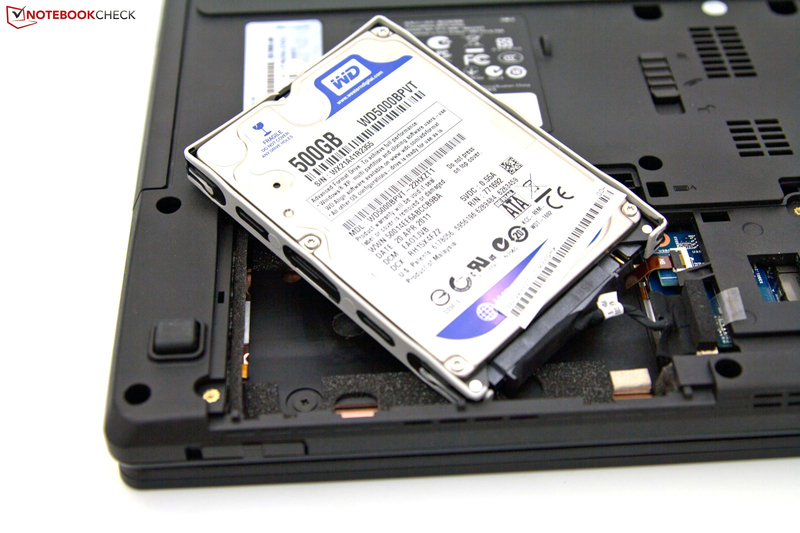 The hard drive is generally not noticeable, and thanks to good decoupling from the case, no vibrations can be felt either. 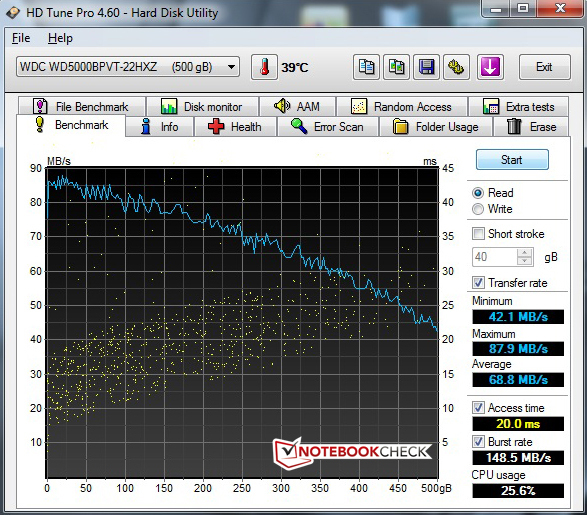 Under load, the values on the screen of our meter rise; with values between 35.1 and 38.6 dB(A) in our stress test (Furmark + Prime95) the notebook is audible but not outside the acceptable range. Overall, an average performance, spoiled a little bit by the occasional spontaneous revving of the fan. 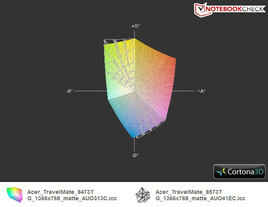 With temperature emissions, the small model gives no advantage to its larger brother Acer TravelMate TimelineX 8573TG. Running office, maximum surface temperatures range between 28.7° C on top and 31.5°C on the bottom. Working is not impeded by the luke-warm surroundings. Under load, with peak values of 47° C, working with the notebook on your legs is not possible anymore. 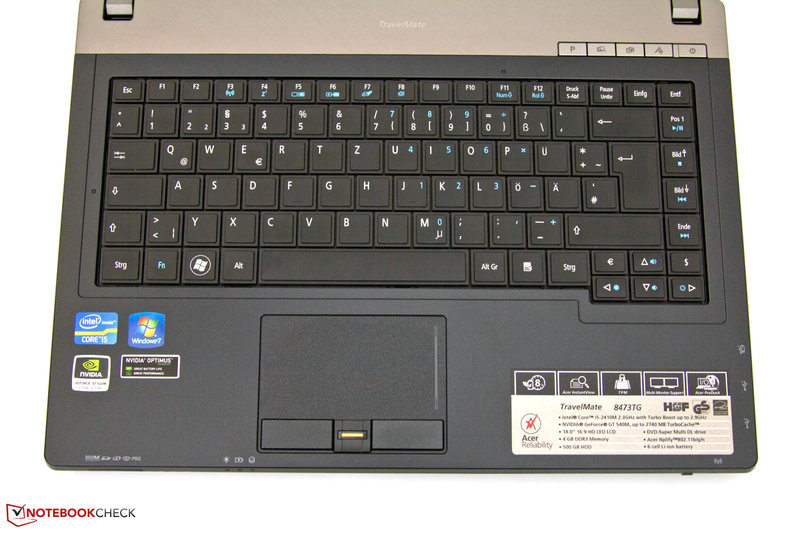 The area around the keyboard also warms up noticeably, while the free space between keyboard and housing prevents the temperature from rising too much in the area of the wrist rest. 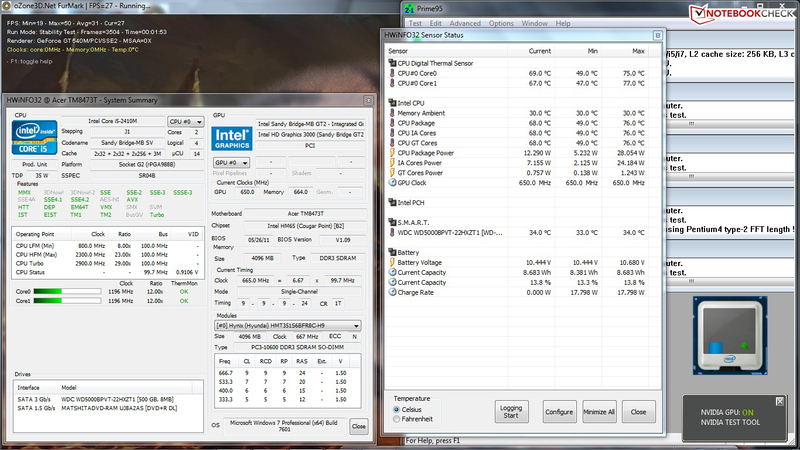 We checked the temperature curve under load of the CPU and GPU closely, in the stress tests with Furmark and Prime95. 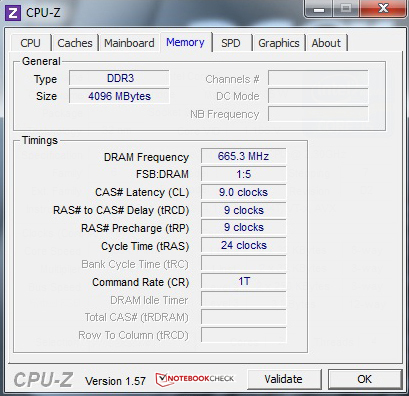 Overall, we could not capture any unusual temperatures after several hours, just the fact that the CPU occasionally switched from its normal 2.3 GHz or 2.9 GHz (turbo) clock speeds into energy saver mode (800MHz), should be mentioned. We could not reproduce this behaviour with other software or games. 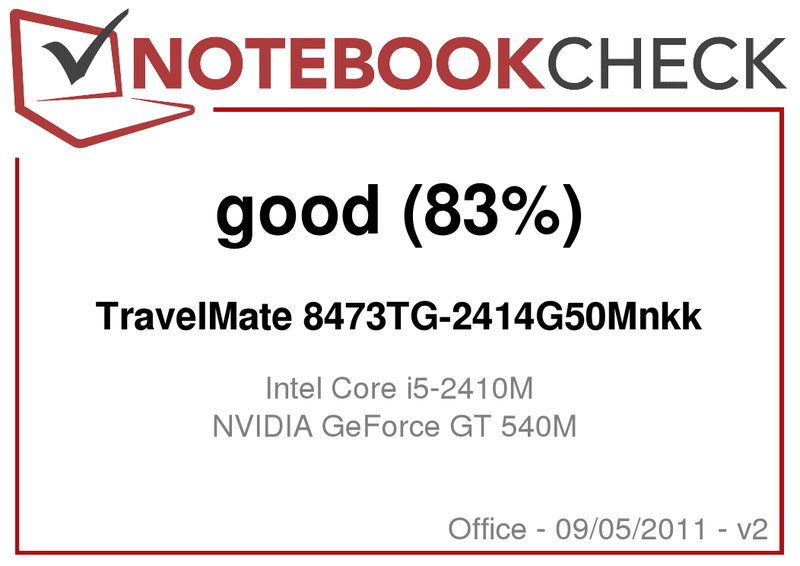 It is not clear to us why the CPU throttled itself during this test; we made the same observation already in the test of its bigger brother, the Travelmate 8573TG. The integrated stereo speakers fail to convince us with their lack of bass, causing the sound to be very unbalanced. For better sound, you should connect some higher quality gear using the 3.5mm audio I/O, Bluetooth or HDMI interfaces. Aside from good performance, this combination of Intel Sandy Bridge processor and automatic GPU switching also pays off with low power consumption. 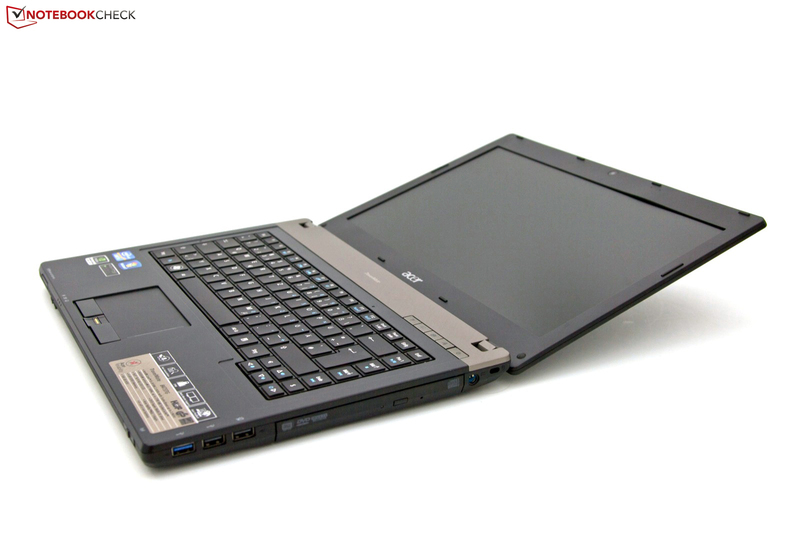 In idle mode using the integrated GPU, the notebook matches the hunting range of netbooks with a maximum draw of 9.3 watt. Under load, with the Nvidia chip and Turbo Boost 2.0 activated, the power consumption is driven up to between 57.3 Watt and 73.5 Watt; a rather large power envelope with notable variability in the power draw. A convincing picture overall, which is continued with the 6 cell battery, even though the capacity of 66 Wh is nothing unusual. The chasm among different measurements continues with the battery runtimes. In the Battery Eater tool's Classic test, which performs OpenGL calculations with the Nvidia GeForce GT 540M GPU running, maximum screen brightness and active WIFI radio, only 2 hours 23 minutes are possible away from an electric outlet. In contrast to this, the Reader’s Test simulates reading of a text document with the integrated GPU used, minimal screen brightness and WIFI turned off. With a result of 10 hours 28 minutes, the device does not need to hide. In this mode, a workday at the office or a day at the university is possible without need for the power grid. And how about measurements closer to common usage, with a more pleasant screen brightness setting? Surfing over WIFI would seem a decent example, which the TravelMate masters without trouble at 5 hours, 47 minutes. This leaves a good impression and makes for a solid finish before the conclusion of this review. 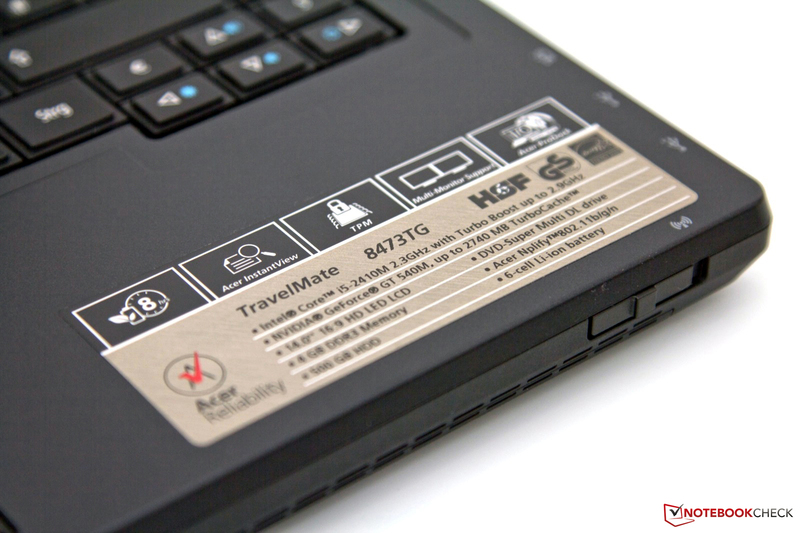 The Acer TravelMate TimelineX 8473TG is a solid business notebook with relatively few weaknesses, several strengths and thus a successful update. Aside from the weak spot near the DVD drive, the workmanship is solid. 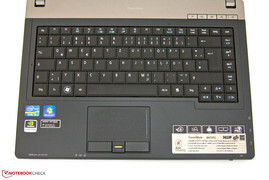 Equipment level and input devices are adequate, while some customers might prefer a chiclet keyboard. The 14" format is gaining popularity and Acer serves the segment with a matte display, but its attributes are lackluster. The performance spread of this notebook is attractive and matches the stats of late model multimedia notebooks, able to satisfy casual gamers. 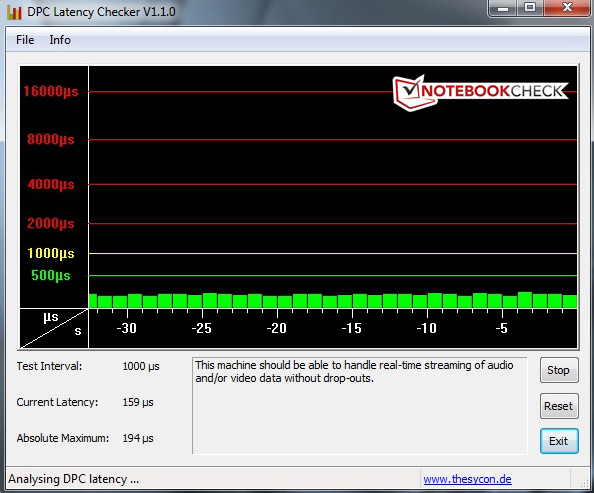 We couldn't detect any throttling problems we had previously observed on some notebooks of Acer's Aspire TimelineX series. However, problems with Prime95 and minimally low frames rates in entry level gaming remained. We were unable to trace the reasons for this, especially considering that component temperatures always remained low enough. Different from the good emission values at idle, temperature and noise under load remain points of criticism; but positive power consumption and battery life values mostly made up for that. 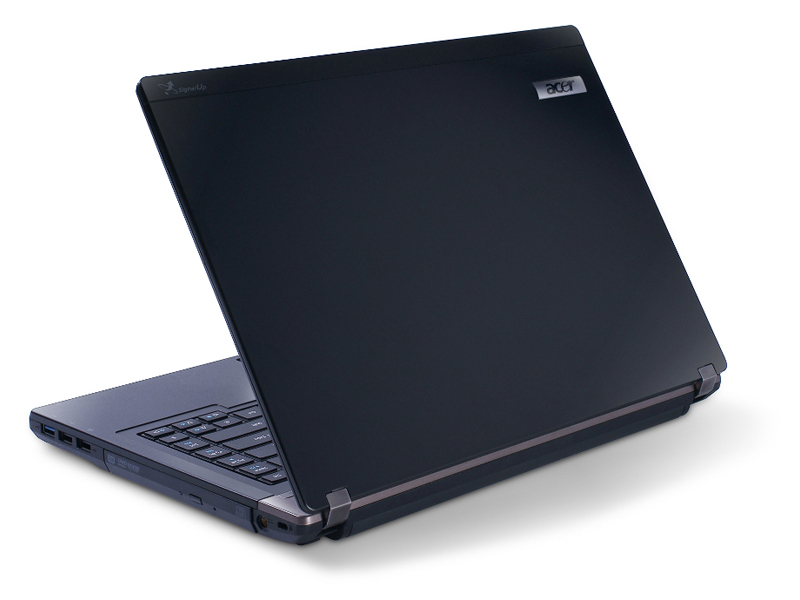 Overall, the Acer Travelmate 8473TG is a coherent notebook, currently available at an attractive price point of 800 euros. We should note that there is a diverse number of alternatives in the 14 inch segment, competing for the favor of customers. 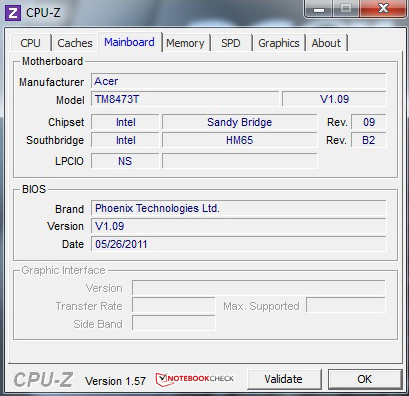 The workmanship of the case, the breadth of interfaces and the performance of the components overall. 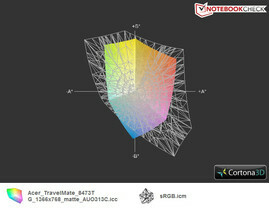 A better display, appropriate for a business notebook, lower heat and noise emissions under load. 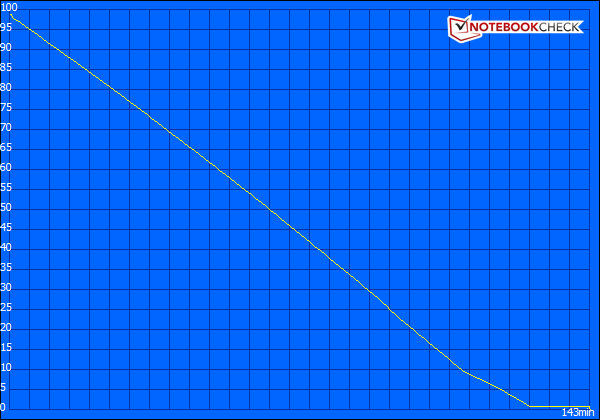 The untraceable loss in the lower performance area (games) and the response under Prime95. Are those remnants from the Aspire TimelineX series? Office notebooks with the latest components. 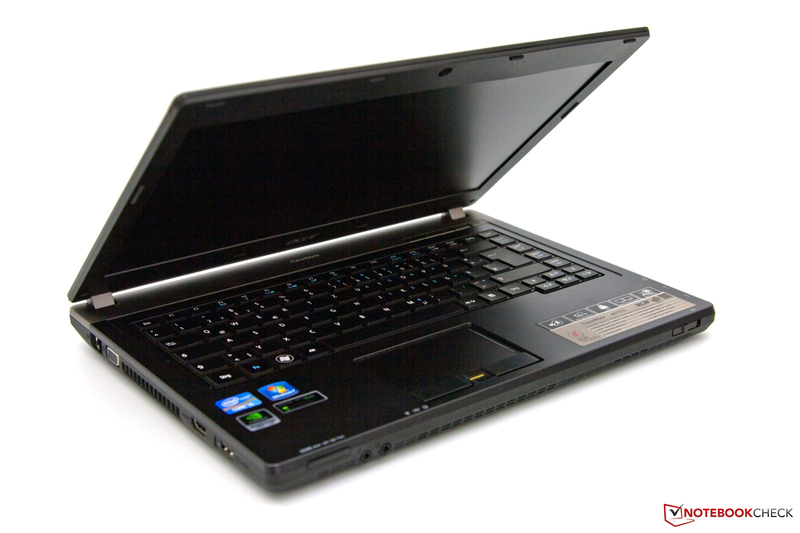 Among them, the Lenovo ThinkPads T420 and E420, the HP ProBook 6460b or the Apple MacBook Pro 13 Early 2011 with aluminum case.